Print, copy, scan, and fax with the network-ready Lexmark MX811DME mono laser printer. This multifunction device is ideal for large workgroups. It has impressive performance speed and it can deliver a maximum resolution of 1,200 x 1,200 dpi. The Lexmark MX811DME mono multifunction printer has a monthly duty cycle of 300,000 pages and it is integrated with 1024 MB of memory and an 800 MHz dual core processor. 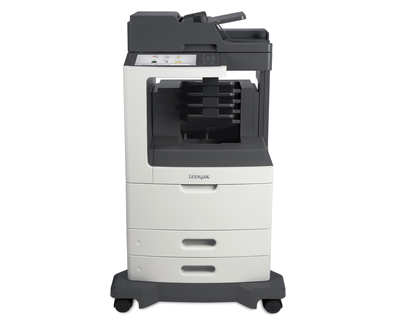 Expect the Lexmark MX811DME MFP to have a large asking price. The Lexmark MX811DME multifunction printer comes with a 10.2-inch touchscreen display and a numeric keypad on the control panel. It also has a 150-sheet automatic document feeder and a flatbed scanner. For paper handling, the Lexmark MX811DME workgroup printer has trays that can hold up to 1,200 sheets. Print speed can go as fast as 63 ppm with the first page out in 4.4 seconds. The fax has a modem speed of 33.6 kbps and transmission speed is three seconds per page. Users don't have to wait long to get their output from the Lexmark MX811DME mono laser MFP. This device delivers professional prints, copies, scans, and faxes. It has a USB host for easy printing from and scanning to thumb drives and also offers email functions. With the built-in Ethernet, networking is easy. The MX811DME black and white multifunction printer offers a duplexer to lower paper waste and an RADF for easy scanning of two-sided originals. High quality Lexmark MX811DME toners can produce crisp black and white output for as many as 45,000 copies. The main device is quite pricey itself and the wireless LAN is an additional cost. The Lexmark MX-811DME printer could be more convenient if it allowed direct access from mobile phones or tablets.